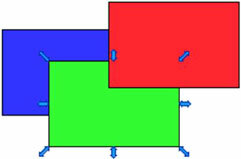 Graphics objects use a hierarchical order. 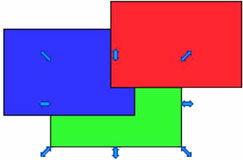 If two objects overlap, the one located higher overlaps the one located below it. You can change the order of the objects by raising them up to the top or lowering them down the bottom of the layer. 1. 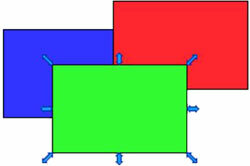 Create a new object and use Edit -> Copy and Edit -> Paste on same location Now you have three rectangles of the same size. For easier visualization, fill each object with a different color (function Properties – Fill – Color) and drag the objects so they partially overlap.